PRODUCT 120 HVT Hipot Tester : DATA ENTRY GROUP CO.,LTD. | DATA ENTRY GROUP CO.,LTD. Fully automated three phase Transformer Turns Ratio Meter. AC/DC Partial Discharge Test System. Mobile Insulation diagnosis & Analysing System. Partial Discharge Trending System For Rotating Machines. Short Description : The 120 HVT Series AC test sets are specificlly designed to perform quick and accurate AC dielectric tests.The 120HVT has a maximum output of 120 kV at 10 mA. 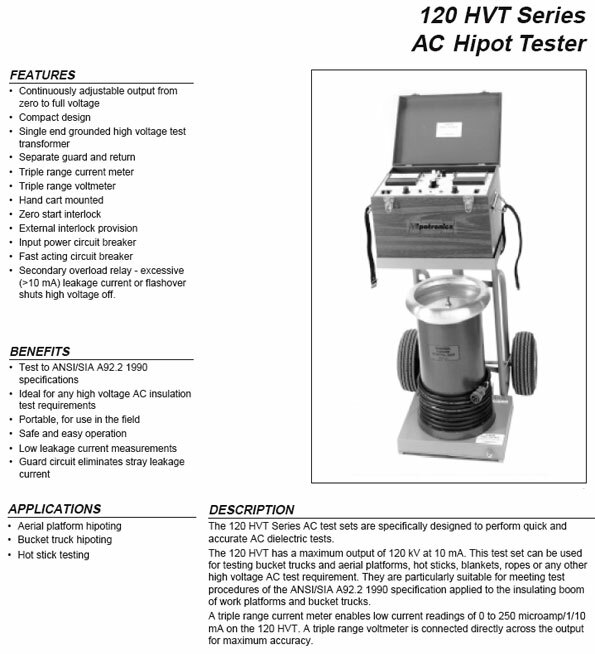 This test set can be used for testing bucket trucks and aerial platforoms, hot stricks, blankets, ropes or any other high voltage AC test requirement. The 120 HVT Series AC test sets are specificlly designed to perform quick and accurate AC dielectric tests.The 120HVT has a maximum output of 120 kV at 10 mA. This test set can be used for testing bucket trucks and aerial platforoms, hot stricks, blankets, ropes or any other high voltage AC test requirement. © 2000-2008 CopyRight by DATA ENTRY GROUP CO.,LTD.